This article builds, and extends, on the coverage of two theoretical concepts with significant impacts on entrepreneurial firms and their internationalization, both of which have already appeared in the journal. One discussed the concept of entrepreneurial orientation (EO) and the other discussed the life-long impact of a firm’s early entrepreneurial heritage, including the firm’s entrepreneurial, marketing, and strategic orientations with carryover effects through the early stages, if not throughout, the life cycle of a firm (Etemad 2015 and 2018, respectively). In response to environmental dynamism, both of these complex concepts will have to evolve overtime to have significant effects on entrepreneurial firms. Combined, they distinguish entrepreneurial internationalization (EI) from the traditional form of internationalization, and such distinctions are based on a combination of entrepreneurial orientation (Carlos and Pinho 2011; Covin and Slevin 1991; Etemad 2015; Lumpkin and Dess 1996; Miller 1983; DeClercq et al. 2005; Deligianni et al. 2015; Javalgi and Todd 2011), marketing orientation (Kohli and Jaworski 1990; Hong et al. 2013; Kirca et al. 2005; He and Wei 2011; Kohli et al. 1993; Rodriguez Cano et al. 2004; Sorensen 2009), and strategic orientation (Etemad 2018; Deutscher et al. 2016; Covin and Slevin 1989; Morgan and Strong 2003). Due to the conditions facing entrepreneurial firms in international markets, these orientations and their market manifestations are likely to be different from those of others. However, a comprehensive system of measurements for characterizing potential differences, mainly due to differences in their operational characteristics and their consequent outcomes in international markets, has remained relatively underexplored, and possibly unexplored. This is in part due to the absence of a comprehensive theory of entrepreneurial internationalization, and partly due to the implicit assumption that the prevailing system of measurement, designed for other forms of internationalization, would be adequate. In spite of growing interest in the field (e.g., Boso et al. 2012; Cadogan et al. 2016; Deutscher et al. 2016; Dimitratos et al. 2004, Hong et al. 2013; Montiel-Campos 2018; Hosseini et al. 2018; Montiel-Campos 2018; Pehrsson 2016; Sundqvist et al. 2012, amongst many others, including the increasing number of articles published in this journal), the need for coherent and internally consistent system of measurements, based on a comprehensive body of theory, still remains a challenge. Empirically, and operationally, however, there has been a long-standing interest in deeper understating of potent strategies that leads to successful internationalization and also a need for a system of measurements that characterize EI and distinguish it from other approaches, regardless of the firm’s size, age, capabilities, etc. The characteristics of internationalization in traditional firms has been measured by relatively tangible measures that characterize a firm in general and the extent of its international activities in particular. These measures include, but not limited to, the number of foreign markets in which the firm is active (regardless of complexity, diversity and size in each market), the firm’s volume of international sales (usually as a percentage of the overall sales regardless of the nature of product line(s) or the size of portfolio in each market), return on sales or assets, and the size of international employees (as a percentage of the number of overall employees), amongst a host of others, most of which relate to the age and the size of the firm. Disregarding their possible incomparability across different markets and time periods, these measures, however, do not explicitly reveal how entrepreneurial a firm has been in the past and how its basic orientations have evolved and influenced operations or have been affected by environmental factors overtime at home and in international markets. More importantly, the traditional measures are incapable of portraying the entrepreneurial interactions between the home and international markets overtime. The true portrayal of the prevailing dynamics not only can provide us with a richer theoretical understanding but also they can point to, for example, the advantages and inadequacies of the prevailing system. Accordingly, we suggest a need for a more effective system of measurements and for a higher clarity. Accordingly, the two cases are characterized and then compared below. They would internalize their advantages within the mostly corporate-owned sister subsidiary network or at few strategic locations, including home. Combined, the traditional theories characterized internationalization as the expansion of home operations through relatively closed network of foreign operating units, operating within the international firm’s internal hierarchical market, portraying a relatively risk-averse and slow trajectory of international growth across markets and time periods. The above-discussed measures characterize the extent, and the state of such internationalization relatively well, but not the presence, or absence, of entrepreneurship, as entrepreneurial internationalization was not a part of the prevailing perspectives at the time. As a result, entrepreneurial orientation and its corresponding behaviors neither played a significant theoretical role in the conceptualization, or their prevailing implementation in international markets, nor did they help enrich their evolution. Stated differently, and as compared to their traditional counterparts, these firm’s approach to internationalization is very different—e.g., it is more competitive, collaborative entrepreneurial, time-sensitive and responsive to their collaborators, customers and markets. 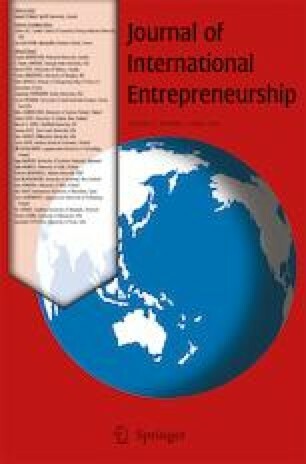 These fundamental differences, in part or as a whole, have influenced developments in the young field of international entrepreneurship and the scholarly research that is further elaborating on the emerging aspects of internationalization (and hence this journal’s focus on entrepreneurial orientation) that are characterizing not only an expanding body of international entrepreneurship (IE) theory, but also pointing to different manifestations of IE in the international markets. The main aims of this article are to discuss the overriding theme of this issue and to elaborate on its characteristics in order to examine the next four articles in this issue and mutually relate their arguments in order to contribute, and enrich, our collective understanding. To facilitate in reaching these aims, this article starts with a brief review of selective interactions and interrelations amongst orientations and their further developments that have influenced the field over the past two decades in order to provide richer theoretical and practical perspectives. This article unfolds in three parts. Following this brief introduction, “Brief review and further developments” presents a brief overview of entrepreneurial firms’ different orientations that set the stage for these firms’ international operations. As discussed earlier, differences between the operational characteristics of smaller, younger, and entrepreneurial firms and their larger, older, and richer counterparts point to a greater challenges facing the former group competing against all others. In light of discussions in part one, “The highlights of other articles this issue and their interrelations” highlights the other four article included in the issue and links their complementary arguments to those in part one. “Discussions, conclusions, and implications” are briefly discussed and presented at the end. Although the embedding context for entrepreneurial orientation is the firm, the context for application of strategy and measuring their effects is market in general, and targeted consumers in particular. The internationalization of entrepreneurially oriented firms exposes the firm to higher complexity and diversity as well as suffering from equally varied constraining factors. Consider, for example, that a firm’s intrinsically strong entrepreneurial orientation (Miller 1983) entails a high degree of innovativeness, pro-activeness, and risk taking, the true importance and value of each of which as well as their combinations depend on the local customers’ preferences in reference to the composition of competitors’ offerings. As consumers’ expectations and preferences, competitors’ offerings and market requirements are not homogenous across markets; an entrepreneurially oriented firm can initially capitalize on a promising combination of its current strength(s) to pro-actively respond to consumers’ existing demand earlier than others, or to offer its highly innovative products and service pro-actively to meet potential customers’ incipient demands, which would allow it to shape and strengthen its competitive appeal, but it may have to absorb potentially higher calculated risks. Generally, the state of innovativeness depends on the firm’s state of capabilities and resources (e.g., Barreto 2010; Gnizy et al. 2014; Lin and Wu 2013; Luo 2000; Pisano 2015; Teece 2007; Teece et al. 1997) while pro-activeness depends on the firm’s state of maturity, market orientation (Rauch et al. 2009) and competitive market information and intelligence (Kohli and Jaworski 1990; Stefanikovaa et al. 2015; Rouach and Santi 2001). The state of a firm’s resources and prior experience will have a bearing on the firm’s capacity to absorb calculated risk. In order to remain, or exceed, the current state of competitiveness, a firm needs current and reliable information about both the market and its evolving trends. If the firm waits for information conveying the arrival of a new trend, or new competitive products, it will be acting reactively. As a result, it will likely fall behind competitors who responded to the time-sensitive opportunity(ies) earlier, as if it did not have a potent EO or cutting-edge MO and marketing to act in time, thus resulting in a de-facto less potent strategic posture and strategic orientation (SO) in the market (i.e., similar to firms with weaker EO and MO). Similarly, the firm’s time and timing orientation (TO) will likely influence the timing of its marketing and its speed for attaining the first mover advantages (Liebermann and Montgomery 1998; Makadok 1998 and Mueller 1997) but it needs to be prepared for absorbing potentially higher calculated risks. Alternatively, by forgoing the time-related opportunity(ies), the firm will have a lower calculated or perceived risk exposure. However, as consumers learn, and competitors act, market conditions further solidify and the true prevailing state would be revealed, thus forcing firms, who did not act earlier, to catch up (or emulate) by rushing to improve upon their initial offering in order to stop declines, and possibly sustain, their respective competitiveness, without which further growth and internationalization will be difficult, if not unlikely. The above discussion provides a brief perspective on interactions between the context and orientations, their mutual dependence, and their collective impacts on consumers, competitors, competitiveness, and markets. These interactions are depicted schematically in Fig. 1 (Modified version of Fig. 1 in Etemad 2018). The relatively early and rapid internationalization of Born Globals and International New Ventures (INVs), due to their relatively more hurried time and timing orientation (TO), indicates that they have maintained their competitiveness, possibly because of their initial orientations and how they had initially come about, and more importantly, how they have made effective and timely adjustments over time and across evolving markets. The above simple discussion suggests that competitive firms need to adjust their strategic posture for attaining high global competitiveness, which may in turn, require addressing themselves to the dynamic intersection of competitiveness and orientations. The traditional internationalization theories may have influenced international marketing practices. Firms interested in international marketing of their goods and service have searched for and selected relatively similar markets (i.e., operationalized the concept of “psychic distance,” suggested by Johanson and Vahlne, 1977) by using a combination of two different approaches to international market selection and segmentation (Cadogan 2012; Cadogan et al. 2016). They have clustered markets into relatively homogeneous, but different groupings, based on their similarities and differences. Alternatively, they have grouped similar consumer behaviors to form similar segments across a few markets (Kirca et al. 2005; Leonidou and Katsikeas 2003). Such groupings are likely to facilitate targeting similar international market clusters, or similar customer segments, which can potentially reduce the costs and time of adjustments from one to the next due to their similarities. The firm’s orientations, especially the intersection of MO and EO, and possibly others, facilitate the choice and application of certain strategic orientation, and actions, which would in turn allow the firm to focus on a specific market segment, or cluster, in order to improve upon the appeal of its offerings across markets and time.1 Similarly, the firm’s state of resources and capabilities would favor a-priori expectation of certain consumers’ needs and wants, which would allow for concentrated learning about their respective behaviors easier and faster and in a less risky fashion to further improve upon the firm’s competiveness, than other choices and actions. The traditional internationalization theories maintained that lower differences between home and host contexts would allow for higher commitments to the market, which in turn facilitate “experiential learning” (e.g., Johanson and Vahlne, 1977) in one market to enable the formulation of more potent strategies for not only that market, but also in other similar markets with relatively close “psychic distances” (Johanson and Vahlne, 1977), which would help to reduce the internal and external costs of adjustments from one to the next. Naturally, such market expectations need verification through actual market tests in the markets to enable offering products and services with potential to attain the highest possible perceived value(s) at relatively lower calculated risks, but this procedure would not offer a viable defense against competitors with higher MO, EO, and more hurried TO, who would tend to offer more innovative goods and services earlier in a given market. Specifically, a firm’s higher degree of pro-activeness and innovativeness can prepare it for a continued string of higher perceived value products and services before its competitors could learn from, and emulate it. This argument suggests that the firm’s timing and learning orientation (mainly its TMT’s sense of timing or time orientation—TO) are mutually dependent on other orientations, and their combination can have significant impact on the firm’s internationalization and international growth potentials. Generally, a firm is assumed to be embedded (Grannovetter 1985) in its home environment prior to its internationalization and its operations need to comply with acceptable requirements of that environment (e.g., competitive, economic, institutional, legal, and socio-cultural dimensions), which individually and collectively set implicit operating baselines for comparing firms in the environment.2 As discussed earlier, a firm’s initial strategic posture (Covin and Slevin, 1989; Morgan and Strong 2003) for improved competitiveness is usually based on the state of its capabilities and strategies (Deutscher et al. 2016) as well as early orientations, all aligned with its environmental, including its competitive, contexts. Such alignments need to exceed the minimal baseline requirements in order to conduct its competitive activities effectively. Logically, any component of its orientation(s), or strategic action(s), needs to meet its corresponding minimum standards, but exceeding them can improve on its competitive position in the market. Rising competitive levels, regardless of the source, exert upward pressures on competitive conducts, which may in turn necessitate an early revisiting of prior orientation(s) and upward adjustment(s) in their corresponding strategic actions, as environmental and competitive conditions change, evolve, and stiffen over time. The traditional theories of internationalization, with a focus on large and resourceful firms, such as multinational enterprises (MNEs), suggested early entries into markets similar to home, which exposed the firm to lower risks and reduced needs for drastic adjustment in their subsidiary’s local marketing. The eclectic theory of MNEs (Dunning 1980, 1988; Rugman 2010) characterized MNEs as the owners of strong firm-specific advantages (FSAs), whose competitive strategies were formulated initially for home and based on its FSAs. The subsidiary operating units enhanced FSAs by complementing them with locally specific advantages (LSAs). In other words, local subsidiary’s core strategies were based on utilizing LSAs to build and strengthen the FSAs; nearly all characteristics of which were fairly known and could be implemented locally. Similarly, they would enter into markets for which their FSAs would have competitive and strategic superiority. These theoretical conditions, combined with the force of ownership, masked the question of true strategic fit with subsidiaries’ local market conditions. Furthermore, the central strategy of large firms, especially those with strong network of corporate-owned sister-subsidiaries, may have benefited from the sister-subsidiary inputs to help them to learn, evolve, and grow overtime. Although its core strategic strength had developed at home with its focus on home, MNEs have not remained impervious to local subsidiary conditions. As a result, the MNE’s network of local sister subsidiaries has made the necessary marginal adjustments for local markets over time, based on their local presence, experiential learning, and rich resources, and thus, immediate strategic adjustments for internationalization did not occupy a critical importance in such institutions, especially when they remained dominant and relatively competitive internationally. Additionally, their collective international experience may have gradually reoriented their orientations towards more local responsiveness and their rich resources may have helped to augment such strategies. As a direct result, the need for adjustments in, if not reformulation of, orientations and strategic actions has not receive critical attention. In contrast to the case of larger and older firms, the internationalizing young, smaller, and resource-constrained firms, such as Born Globals, INVs, and rapidly internationalizing enterprises—RIEs (Keen and Etemad 2011, 2012), did not have the above conditions in general, and especially in the early stages of their internationalization in particular. Therefore, they have been facing more challenging conditions competing with established, and even entrenched, local and international firms (such as MNEs) in local markets. Furthermore, their size and constrained resources would not allow for corporate ownership of their network of local operating units. Especially when they deemed their opportunities as time-sensitive, and possibly decaying over time, they had to include collaborative arrangements with local partners to hasten their internationalization process. Due to their local embeddedness, such local network members could identify necessary adjustments for higher efficiencies and competitiveness. Consequently, the local orientation and strategies of international operating units would tend towards more potent joint strategic positions, enhanced with the partner’s complementary local resources, to support more effective competition with larger and more competitive firms. Such jointly and cooperatively adjusted strategies would not only have resulted in locally well-tuned strategies, but also their mutually rewarding collaboration could have increased the local implementation efforts for more successful internationalization. The noteworthy point is that the adoption of such, or similar, locally well-adapted internationalization would require openness to a higher joint entrepreneurial and collaborative orientations (EO and CO) than those of the corporate-owned local operating units. This argument suggest a necessary condition—i.e., the intersection of two firms’ orientations need to be conducive to higher coordination and mutual dependence of both the local and international partners for effective joint strategic actions, which in turn suggest that the intersection of EO, EO, and CO needs to be open to jointly adapted potent strategic actions. As an example of such joint orientations and strategic actions, the local partner could ask for offerings more innovative goods and services (e.g., higher EO), or more responsiveness in terms of faster introduction of the new products (e.g., higher MO), or jointly assuming higher mitigated risks than those of others, in order to improve upon the potency of their joint competitive strategy for competing more effectively. Alternatively, a stronger local MO (e.g., more effective communication, stronger distribution, or even more competitive pricing in conjunction with finer segmentation and positioning in the local market) would strengthen the brand equity and local presence, thus providing for higher competitiveness and for obtaining a higher share of the market. Naturally, and depending on the state of competition and environmental context, other more potent combinations and permutations of orientation and their associated competitive strategies could be jointly explored. Stated differently, smaller and younger firm’s entrepreneurial internationalizations are likely to be different from larger and traditionally oriented firms in terms of adopting relatively higher EO, MO, CO, and TO (when there are time-sensitive opportunities). Due to higher local involvements, this combination would inherently have a lower “foreignness” (Hymer 1976) and “outsidership” (Johanson and Vahlne, 2003, 2010) and higher competitiveness, thus enabling more beneficial local experiences with reduced risks and lower adverse impact on their constrained resources in international operations. Such higher entrepreneurial internationalization is in part due to higher EO, MO, and collaborative partnership for more potent joint local strategic operations. Leveraged across markets and time to result in faster internationalization with less dependence on large resources and home market (which are readily observable in entrepreneurially internationalizing firms, such as Born Globals, INVs, and RIEs). The above provisions can also serve as pillars for defining a theoretical space, within which an integrative conceptual framework, or theory, for effective international operations can be devised (we will continue this discussion below and in “Discussions, conclusions, and implications”). The second article in this issue is entitled When are innovativeness and responsiveness effective in a foreign market? and is authored by Anders Pehrsson. This article brings an empirical perspective on the above discussions of orientation interactions. As implied in the title, the author sets to examine how the international performance of internationalized firms are effected by their orientations and competitive position in various dynamic foreign markets. It examines the influences of entrepreneurial orientation and market orientation and explores how these interacting orientations affect a firm’s competitiveness that is the main driver of performance in international markets. As discussed earlier, orientations can be viewed collectively as the precursors, if not precedents, for setting a firm on a path of strategic actions, the ultimate outcome of which is performance (Boso et al. 2012; Dimitratos et al. 2004; Sundqvist et al. 2012; Jantunen et al. 2005). While performance can be observed and explicitly measured in different markets annually and longitudinally, its drivers remain somewhat opaque. Alternatively, and as implied by this article, it is logical to conceive a set of relations defining performance, which characterize a corresponding theoretical space, within which performance occurs. The competition and presence of many firms in international markets, each relying on different influential factors, suggest that the overall underlying space needs to be open, multi-dimensional, and unbounded and actionable, the main characteristics of which are collectively defined by orientations, resources, and restrictions, amongst other influential factors. Theoretically, it is within that space that a family of coherently fitting relations amongst the influential factors exists and defines a set of complex, consistent, yet adaptive and actionable activities and processes (Etemad 2004) giving rise to performance. In other words, such a space defines the overall scope of approaches, constraints, possibilities, strategies, and outcomes for all firms competing internationally. When deemed desired, or necessary, the entrepreneur(s) and the firm (or its top management team—TMT) alter the characteristics, including orientations and strategies, of their operations within that space to improve upon the firm’s performance (Jantunen et al. 2005), while the context (e.g., firm’s resources and capabilities), environmental barriers (e.g., regulations and baselines), competition, stakeholders’ expectations remain relatively unchanged. A firm’s strong, if not aggressive, actions may exert pressure for altering the boundaries, but a firm’s operations need to remain consistent with the space characteristics, as they, for example, remain within the national and international regulatory frameworks. In short, the collectively defined operating characteristic can change slowly, but firm operations may change widely so long as they do not violate the defined and accepted boundaries. Operationally, however, much simplifying abstraction must be applied. The author operationalized firms’ strategic orientation (SO) in terms of two “actionable” components of EO and MO—i.e., the market-driven innovativeness and market-driven responsiveness that potentially impact performance in the firm’s operating units in international markets. The institutional context of the study is 166 international operating units of Swedish industrial multinational enterprises (MNEs) with a combination of 110 corporate-owned and 56 cooperatively operating units, each with its own dynamic capabilities while facing respective constraints, contextual barriers, and competition. The independent variable of performance was measured by return on sales. Each of the independent variables of innovativeness and responsiveness were measured with the average of three validated scales. Institutional barriers and ownership were treated as moderating variables, while four others were treated as control variables (see Table 1 of the paper for an overview description of variables). The results report two significant findings. Hypothesis 1, predicting a positive relationship between innovativeness and performance, was partially supported, as one of the eight statistical models did not support the relationship. Hypothesis 2, predicting a positive relationship between responsiveness and performance, was also partly supported, as the responsiveness variable was positively associated with performance in one model but not in the full model. The orientation can be viewed as the precedent and an enterprise-wide dominant logic, acting as an umbrella for the formulation of strategy, competitive strategic actions, and their consequent performance. The enterprise’s strategic orientation (SO) relates to the various local performances, but its true impact depends on how the operating units translate the overall SO into local strategies that are operationalized and implemented differently by the local operating units. Simplification resulting from deep abstraction from the true interactive and adaptive system is bound to produce partial, and possibly misleading, lessons and results. The third article in this issue is entitled Exploring the Role of Individual Level and Firm Level Dynamic Capabilities in SMEs’ Internationalization and is coauthored by Darshana Mudalige1, Noor Azizi Ismail, and Marlin Abdul Malek. This article picks up the discussion from where the second article left off and further contributes to previous arguments by introducing and distinguishing between different levels of enacting forces that exert potential influence in general and those of dynamic capabilities (Teece 2014) in particular. Furthermore, it raises the possibility of interactions between dynamic capabilities at the individual level and at the firm level influencing internationalization of exporting SMEs (i.e., less than 250 employees) in Malaysia’s developing economy context. Similar to the second article invoking dynamic capabilities as one of the influential factor in performance, this article relies on the theoretical linkage between internationalization and firm-level assets and capabilities before examining the impact of individual level (i.e., owner-specific) dynamic capabilities on internationalization. Although the second article did not explicitly account for interactions between the differential effects of qualitatively similar influences coming from different levels, such potentially different impacts were envisioned in the “Brief review and further developments” section (see Fig. 1, above, for example, schematically depicting different two-way influences emanating from the individual and firm levels as well as their combined and adjusted interactions with their embedding environment and beyond). Two methods of administration were used to collect information on measures operationalizing this article’s six hypotheses, from 197 firms. The analysis of results pointed out that both the owner-specific and the firm-level dynamic capabilities would positively influence internationalization, but the firm level mediated the impact of individual-level dynamic capabilities on internationalization. Stated differently, both the second and third articles suggest, for example, that “dynamic capabilities” of different levels—i.e., the entrepreneur and the firm—are likely to have different, but complementary impacts on performance, which point to a need to account for similar influences coming from different levels and allow for their combined action, interactions, and possible integrations. The forth article in this issue is entitled Business model innovation of international new ventures: An empirical study in a Swedish context and is co-authored by Jan Abrahamsson, Håkan Boter, and Vladimir Vanyushyn. Similar to other innovations, business model innovations are expected to contribute positively to attaining higher firm performance in general and in internationalized firms in particulars. Generally, innovation in business models is accomplished through basic improvements, or change, in one, or a number of related, components in the value system with carryover effects across the entire value creation and delivery as well as value capture subsystems. Although it is possible to measure the impact of any specific innovation locally and throughout the system, business models provide an overview of such impacts by abstracting from nuanced operational details in order to clearly see: (i) the efficiency of the overall process and (ii) weather the entire system is capable of creating, delivering, and capturing more values than before, including those initially intended or necessitated by evolving competition. However, such macro and overview do not negate the value of introducing innovative improvements at various levels in a potentially well-coordinated operations, especially in INVs that are operating under highly competitive operations in their international markets. Theoretically, changing context or competition, necessitate an examination of the business model and the need for innovation in the corresponding value system(s). However, a-priori analyses of business model innovations’ consequent impacts on different stakeholders, and especially for their unintended consequences, become necessary before they are applied. Although most innovations are introduced to improve, and have direct impact, upon a part of value system, their effect on the overall perceived values by the ultimate stakeholders should be considered. Therefore, a comparative analysis of different alternative innovations can point to their competitive advantages and pitfalls, especially in highly competitive international environments that are capable of inflicting damage beyond one market in short time period. Operationally, however, reported business model innovations are more specific to, and applied for, improving upon a part of the value system, especially in smaller firms that face high levels of external complexity in international markets. Based on extensive review of the extant literature, this paper formulated three hypothesis regarding specific innovations in INVs’ value systems. The analysis of results for the Swedish INVs points out that innovations are not system-wide and mostly involve specific innovation in the value-delivery and value-capture aspects, mainly in the distribution channels and in the logistics functions. Furthermore, the longitudinal analysis of the paper indicates that INVs continue their innovative efforts, which further differentiate them from other international and internationalizing firms and enable them to compete with their larger and competitive counterparts as the environment becomes increasingly less forgiving. The fifth article in this issue is entitled International ecopreneurs: The case of eco-entrepreneurial new ventures in the renewable energy industry and is coauthored by Seyed Meysam Zolfaghari Ejlal Manesh and Alex Rialp-Criado. This paper extends the above discussion of business model innovations far beyond business models and into entrepreneurial inventiveness based on entrepreneurial recognition of emerging opportunities. This paper suggests that eco-entrepreneurs have identified in the ecosystems’ sustainability as an international opportunity and are building firms and industries to maintain and enhance them. Given the broad and worldwide need for sustainability, especially in light of carbon economy inflicting increasing damages on the environment and harming affected populations, these internationally oriented entrepreneurs have focused their attention on internationalizing renewable energy to reduce the damage. The paper is based on six case studies of eco-entrepreneurial ventures in pre-commercialization stages in Spain. These eco-entrepreneurs envision value in improving upon the living environment to make it a better place to live. Expectedly, not all world inhabitants are their targets now nor in the near short term, but the pro-activeness and risk-taking components of their entrepreneurial orientations must be propelling them forward. Naturally, such long-term-oriented and visionary entrepreneurs are exposed to higher than easily quantifiable risks and uncertainties; the defense against which is to accumulate ample multi-level dynamic capabilities in terms of acquisition of human capital, social capital, and necessary firm capabilities and resources. 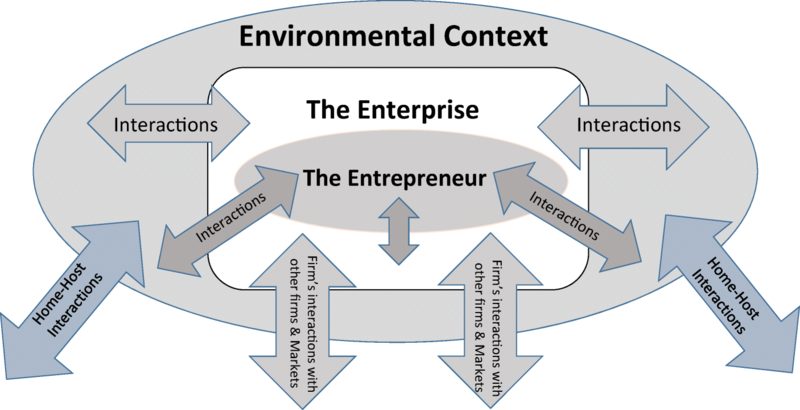 Furthermore, given the fluidity of the current, and uncertainties of the emerging environment, locally and internationally, eco-entrepreneurs as a whole need to encourage environmental change and higher conversion of fossil-based energy to renewable energy, mainly through public policy reformulation, verging on macro business innovations, neither of which have been a part of traditional entrepreneurial education and training. Implicitly, the topic of this paper brings a closure to the earlier discussions of orientations, strategic actions, and multi-level dynamic capabilities that interact individually and collectively, which portray the emergence of a dynamic, open, complex, and adaptive system (Etemad 2004), to which all firms need to adapt. In such systems, all participating members must be prepared to interact with others and continually adapt their strategic actions in order to help the system move forward and assume an optimal position, where most agents can experience a higher likelihood of realizing their entrepreneurial objectives without inflicting harm on others. The “Introduction” suggested that orientations would initially be designed to guide the firm’s competitive processes. As discussed earlier, orientations and their interactions would evolve due to the firm’s internal maturity and change in external influences and become increasingly more potent and possibly bounded by regulations and restrictions, which will eventually have bearings on the final growth and firms’ internationalization objectives and outcome(s). Logically, a conceptual framework, or a theory, based on a set of assumptions and guiding principles, some explicitly stated and some remaining implicit, should have been invoked to shed light on a range of problem facing firms internationalizing entrepreneurially. In the absence of such a comprehensive framework or theory, the initial discussions in “Introduction,” part I and part II of this article presented firm orientation as the basic underlying frame influencing the processes that project a path towards more competitiveness locally and internationally. A further elaboration of such a need, and preliminary steps towards its conception, was presented in the second article of this issue offering some insights towards that comprehensive, or theoretical, framework in order to guide the further development of entrepreneurial internationalization. However, the scope of this article would preclude building such a framework, but it is logical to encourage efforts towards its constructions as a challenge to the scholarly community. A further examination of orientations’ interaction in the earlier parts of this article point to substantial complexities. 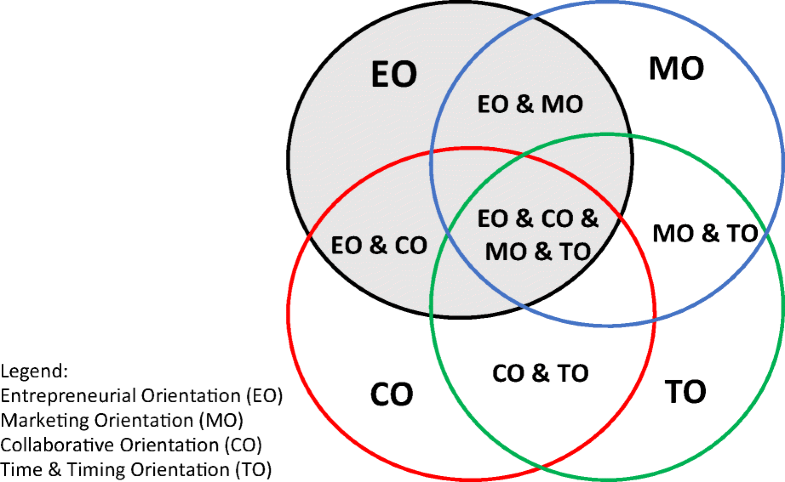 Restricting orientation to only four basic ones (EO, MO, and CO and TO) and disregarding the gravity and extent of their true influences on firm’s various operations, Fig. 2 schematically depict their various intersections indicating the possibility of a rich combination and permutations of interacting, or mixed, orientations, which collectively raise a fundamental question: which combination(s) of orientations and their interactions (shown as intersections in Fig. 2) and under which circumstances will they be effecting different operations locally and internationally; and furthermore, how had they arrived to that state of operations and will be evolving beyond it? With the above question imperceptibly present in the background, the “Introduction” examined both the theoretical and possible operational examples of three groups of different interactions to offer examples of how such orientations and their interactions could lead to effective strategic actions and yielding successful internationalization outcomes. The second article in this issue empirically examined the “actionable components” of EO and MO interactions and pointed to the operational complexities involved in such of explorations. Furthermore, the third article raised the questions of interactions between two (or amongst many) different levels in a qualitatively similar, and possibly identical (e.g., dynamic capabilities), influences (see interactions between entrepreneurial and firm-level interactions in Fig. 1). Furthermore, the last two articles of this issue drew attention to the role of innovation, at the more micro levels for increasing value within an existing value system on the one hand, and at more macro levels far beyond those already prevailing and even exceeding towards the creation of new systems offering higher perceived values on the other hand. A clear conclusion of the above discussions is that the potential impact of orientations, their evolutions, and interactions, with a view to attaining higher performance in international markets, deserves our full scholarly attention and further developments. The more critical implication, beyond the initial, intrinsic, personal, and entrepreneurial orientations, is a set of three basic questions facing owner-managers and top management teams in the early stages of entrepreneurial firm’s life cycle: how, what, and from where to conceive, articulate, and operationalize firm’s orientation(s), regardless of the early initial and even personal choices? The evidence from family firms suggests that family discussions are fertile grounds and a conduit for the formation of orientations and subsequent strategies. Population ecology and social capital studies point to acculturation and socialization impacts within socio-entrepreneurial networks, while the emerging institution- and education-based entrepreneurship have gravitated towards in-stream training. The jury is still out, and the open challenge is still before the scholarly community. The silver lining, however, is that the early building block of such human capital, and its institutional counterpart will have significant carryover effects that can bear substantial fruits. Therefore, the Journal of International Entrepreneurship (JIEN) will encourage efforts towards, and proposals for, building such promising orientation systems. Although consumer profiles, and their corresponding market behaviors, change in dynamic and open environments, those incremental changes are likely to be smaller within a segment, or within a cluster, as compared across them. The comparable practical example of international marketing practice is to identify a narrow market segment, or niche, in one market and search for similar one in other markets, for whom a similar bundle of goods of services could be initially offered. Furthermore, consumer behavior for certain class of products that offer nearly similar applications and use, such as special-purpose software, remains similar across markets. This explains INVs’ and Born Globals’ heavy reliance on international market niches worldwide. Generally, the concept of baselines refers to a set of minimum standards for acceptable conducts, which are also used for comparative analysis as well.